Jim's shoot was on an early fall morning at the legendary McSorley's Old Ale House in NYC. The location provided so much inspiration, and art director Mary Colston had a blast setting up some additional touches to the already incredible bar. It was more of an editing session- removing clutter, and any modern items, which did not fit in the scene. Also– beer as a prop... Now you're talking! Stevie Ondra, the costume designer, had to dress two characters: the bartender and the coal miner. To create the coal miner's outfit, Stevie carefully searched for a shirt and overalls that could look like they would exist at the turn of the century. We researched photos of real coal miners from that time and used it as a guide. She replaced all the buttons in the shirt with buttons that were more historically appropriate, and distressed both the shirt and the overalls to look as though they have been worn for work at the coal mine every day for the past who knows how long. Mari worked her magic doing Jim's hair and makeup and even a fake mustache to create two very different characters: the greasy coal miner and the impeccably groomed bartender. I ordered a bunch of antique items from eBay to complete Jim's coal miner: a Thermos lunch box, an oil lamp, and the incredible gold pic axe, which almost got me in trouble as I was transporting it into Manhattan. All the above are now displayed in my living room, and are quite the conversation starters. Jim was so much fun to work with, it was amazing to watch his genius in action, as he switched from one character to the other. He made us all laugh on set, all while being the ultimate professional, the perfect subject! Setting up the shot- Mari and Mary standing in for Jim before he arrives on set. Pre-shoot review of the setup. Stevie Ondra on Wardrobe, costume design. Mary Colston on props and art directing. Getting the framing right for both characters. Mari OcConor on Hair & Makeup. Making sure we are on the right track. Wardrobe, hair & makeup revue. 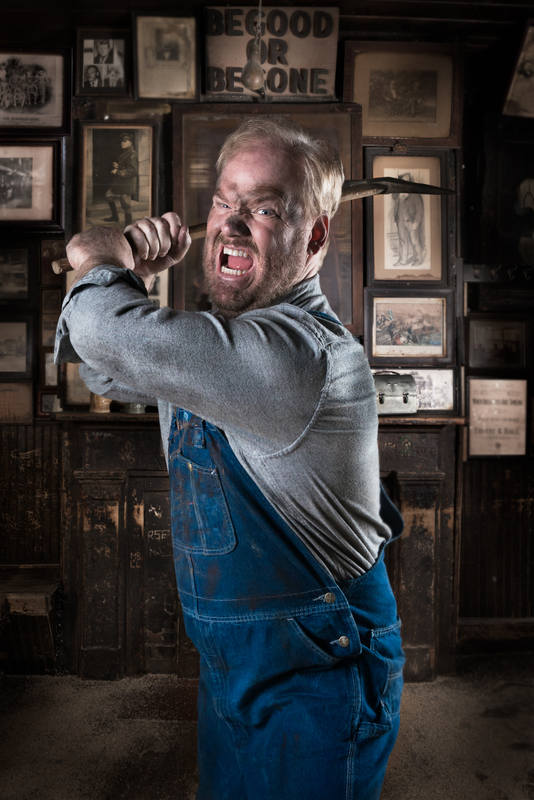 McSorley's manager spreads some saw dust for the shot. Team Shot: end of scene one. I always like to keep my lighting setup as simple as possible. For this shoot, you can see my very simple setup in the BTS images for both scenes. One light only in a 45 degree angle on camera left. Although for the bar scene, I did have some additional ambient light added because the bar was super dark and it was hard to focus the lens. Adding that bit of extra light helped a lot.